Need a night out? With children this can be difficult, thankfully the Sr. High Youth Group has a solution. 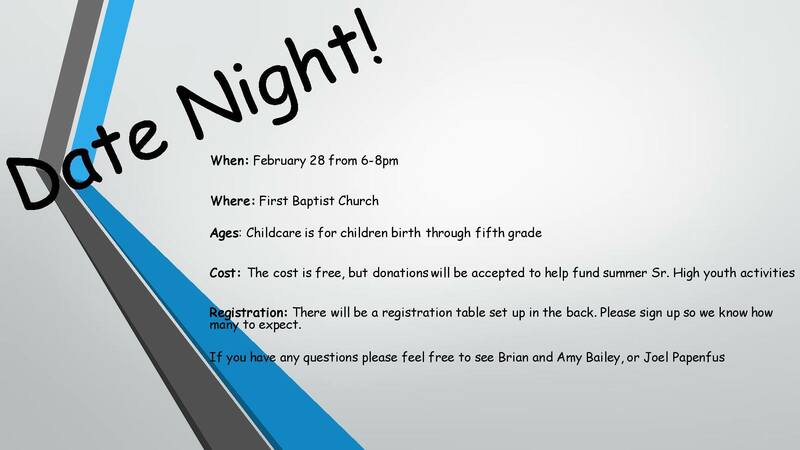 On February 28th from 6-8pm, they will bless us with childcare services for all those from birth to 5th grade here at the church. Please register your children at the table in the foyer so we know how many to expect. The cost is free, however donations are encouraged to help support the youth groups summer activities. Please feed your children dinner first as only snacks will be provided. If you have any further questions contact Brian and Amy Bailey or Joel Papenfus.